Non frictional (non sliding) mechanics. Non frictional mechanics uses loops for tooth movement (non sliding). Canines can be retracted individually or can be retracted along with the incisors. Retraction of the canines along with the anterior teeth as one unit is known as en masse retraction. Both techniques depend on the type of malocclusion and operators' skill and preference. To date, several studies have been published concerning different techniques of canine retraction with the aspect of the application, mechanics, or effectiveness. However, it can be difficult for the practitioner to interpret the results and evidence presented in these studies because a variety of study designs, sample sizes, and research approaches. In view of this, a systematic review of the present knowledge seems desirable. This systematic review was undertaken to answer the following questions. What kind of canine retraction methods/techniques are evaluated in an evidence-based manner? How effective and efficient are the different methods of retraction? Which technique retracts the canine in the least amount of time and the most physiological way? Two reviewers (Drs. 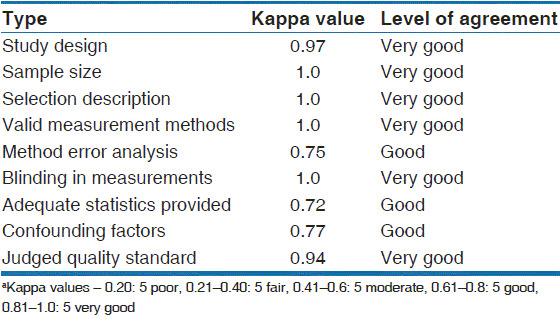 Kulshrestha and Chandra) [Table 1] independently assessed all the articles with respect to the inclusion and exclusion criteria, and the kappa score measuring the level of agreement was 0.94 (very good). Any inter examiner conflicts were resolved by discussion to reach consensus. 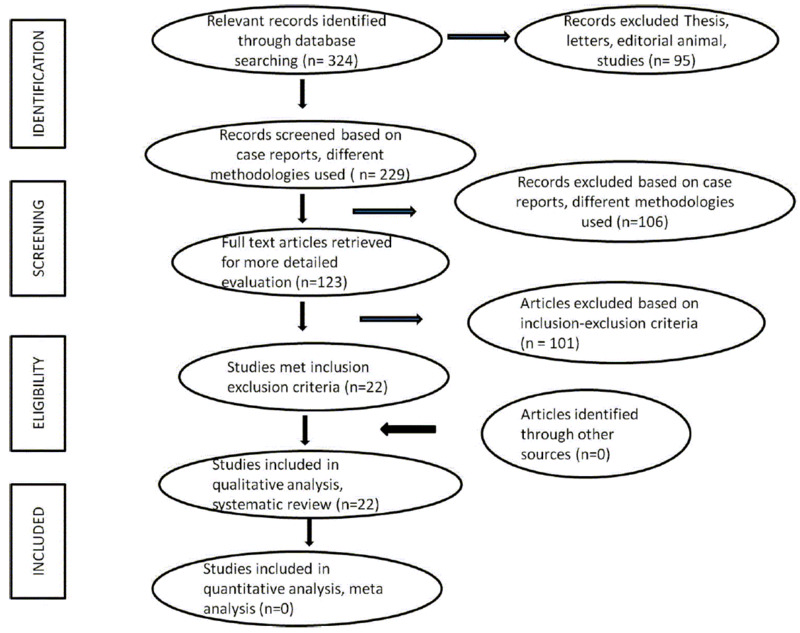 Reporting of this systematic review was performed in accordance with the PRISMA guidelines for reporting systematic reviews of health sciences interventions. Three hundred and twenty-two articles were searched to find the most efficient ways to retract the canines. To identify all the studies that examined canine retraction and their effectiveness, a literature survey was done by applying the Medline Database (Entrez PubMed) and Science Direct database covering the period from 1985 to 2014, and used the Medical Subject Heading term "orthodontics" and was crossed with a combination of the following term "retraction." A flow diagram of the data search can be seen in [Figure 1]. Similar methodology applied for measurement of tooth movement in all the studies. The exclusion criteria included [Table 2]. Studies with different methodologies applied for the measurement of tooth movement. To identify all the studies that examined the relationship between the type of force applied and resultant canine retraction, a literature survey was done. No restrictions were set for the sample size. Only in vivo human studies that have undergone 1 st premolar extraction followed by canine retraction were included. Age and gender restrictions are not applied. Limitations that were seen are also discussed and analyzed. Retraction evaluated at leveling and alignment stages, application of different techniques for rapid distalization of canine such as distraction osteogenesis, laser therapy, and corticotomies before canine retraction, are all included in the review. 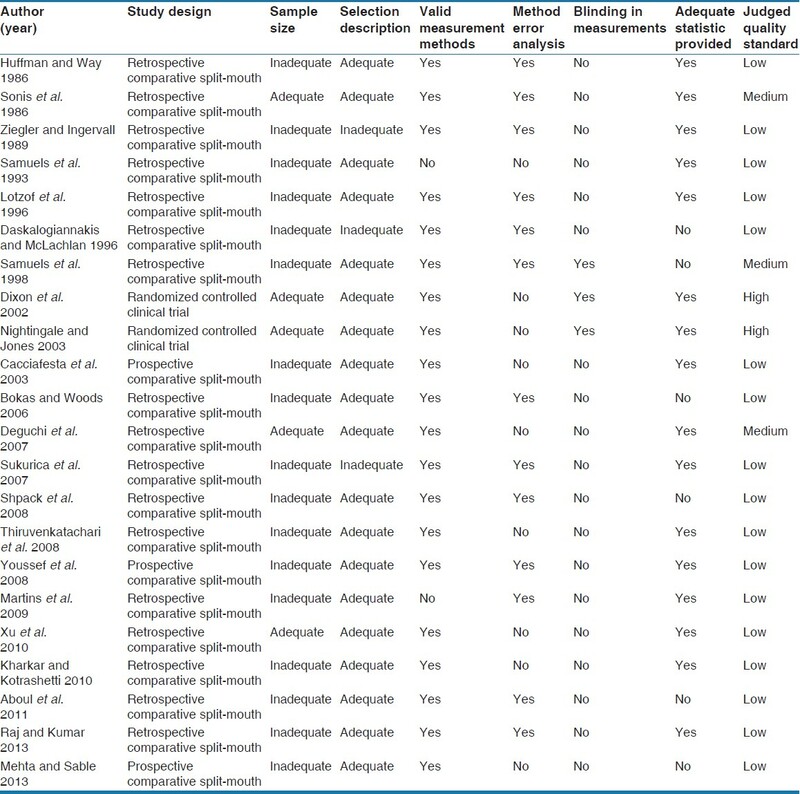 All articles were randomized controlled trials (RCTs) with a split-mouth study design for better correlation [Table 3]. Huffman and Way  compared wires of two different sizes 0.016 and 0.020 stainless steel (SS) and found out no difference. Cacciafesta et al. compared elastomeric auxiliaries in the form of Unitek Alastik chain, Rocky Mountain elastic chain, and Elastic thread and found out that there was no difference between the three. Ziegler and Ingervall  compared frictional with frictionless mechanics; they compared elastic chain with Gjessing retraction spring and also compared Rickett's retraction spring with NiTi coil spring. They found out that with springs rotation is less and tipping is more. Risk of bias assessment of the 22 selected reports, 17 were retrospective studies, 3 were prospective studies, and 2 RCTs were present [Table 4]. Sample size generally applied for these clinical trials was considered conclusive in a few researches. , Optimum force for movement has no specific value. However, a range of 100-200 g is suggested sufficient by Quinn and Yoshikawa ,, and this was the force range observed in the review. It is not the magnitude of force applied rather its duration that is considered important for good biologic tooth response. Light continuous force up to a threshold can provide an optimum force. High initial forces did not achieve greater space closure but resulted in the greater percentage of force decay. NiTi coil springs are believed to provide this constant force,  however, one study contradicted this. In sliding mechanics, the force of friction is encountered, which tends to reduce the force available eventually for effective tooth movement. The data so far reviewed proved that elastomeric power chains, elastic threads, magnets, NiTi coil springs,  corticotomies,  distraction osteogenesis,  and laser therapy,  all are able to provide optimum rate of tooth movements. All the methods were nearly similar to each other for retraction of canines. No one method can be considered superior to another in terms of faster tooth movement or limited side effects. Several methods and scales to incorporate quality into systematic reviews have been proposed and have since been extensively applied to various RCTs in medicine. However, many items were clearly not applicable, for example, placebo appearance/taste, patient blinded, or observer blind to treatment. Instead, the quality of the articles was judged as low, medium, or high according to a scoring system based on the characteristics given in [Table 4]. Many of the studies had serious defects, and according to the criteria used, the majority of the articles were judged to be of low quality. The most serious shortcomings were retrospective study design in combination with small sample size and inadequate selection description. Problems of lack of method error analysis, the absence of blinding in measurements were other examples of shortcomings. Furthermore, the choice of statistical methods was not explained. In all studies, the methods to analyze canine retraction were valid and well-known. However, different measurement methods were used to analyze the retraction, which caused difficulties in comparing the results of the studies. From a methodological point of view, it was notable that only 2 of the 22 studies declared the use of blinding in measurements. It is known that nonrandomized trials or RCT without blinding design are more likely to show the advantage an innovation has over a standard treatment method. This implies that the measurements can be affected by the researcher. An RCT is our most powerful tool to evaluate therapy, and the quality of the trial significantly affects the validity of the conclusions. However, randomization is not always possible, and good quality observational studies may be another option. Two RCT studies , were identified in this systematic review, and both of them were judged to have high quality. In the future, there is a need for additional, well-controlled RCTs concerning the effectiveness of different canine retraction techniques including implant systems and for assessing costs and side effects of the interventions. Two main canine retraction methods were identified: (1) Sliding mechanics (2) Loop mechanics. To obtain reliable scientific evidence, additional RCT's with sufficient sample size are needed to determine which canine retraction technique is the most effective. Further studies should also consider patient acceptance and compliance as well as cost analysis. Vaden JL, Dale JG, Klontz HA. The tweed-merrifield edgewise appliance: Philosophy, diagnosis, and treatment. In: Graber TM, Vanarsdall RL, editors. Orthodontics: Current Principle Sand Techniques. 4 th ed. St. Louis: Mosby; 2005. p. 675-715. Hans MG, Groisser G, Damon C, Amberman D, Nelson S, Palomo JM. Cephalometric changes in overbite and vertical facial height after removal of 4 first molars or first premolars. Am J Orthod Dentofacial Orthop 2006;130:183-8. Jan H. Restore a wide radiant smile without dental extractions. Pak Oral Dent J 2005;25:65-8. Profit WR, Fields HW Jr, Sarver DM. Contemporary Orthodontics. 4 th ed. St Louis: Mosby; 2007. McLaughlin RP, Bennett JC, Travesi HJ. Systemized Orthodontic Treatment Mechanics. Edinburgh: Mosby; 2001. Stalpers MJ, Booij JW, Bronkhorst EM, Kuijpers-Jagtman AM, Katsaros C. Extraction of maxillary first permanent molars in patients with Class II Division 1 malocclusion. Am J Orthod Dentofacial Orthop 2007;132:316-23. Erdinc AE, Nanda RS, Isiksal E. Relapse of anterior crowding in patients treated with extraction and nonextraction of premolars. Am J Orthod Dentofacial Orthop 2006;129:775-84. Chaushu G, Becker A, Zeltser R, Vasker N, Branski S, Chaushu S. Patients' perceptions of recovery after routine extraction of healthy premolars. Am J Orthod Dentofacial Orthop 2007;131:170-5. Janson G, Busato MC, Henriques JF, de Freitas MR, de Freitas LM. Alignment stability in Class II malocclusion treated with 2-and 4-premolar extraction protocols. Am J Orthod Dentofacial Orthop 2006;130:189-95. Hayashi K, Uechi J, Murata M, Mizoguchi I. Comparison of maxillary canine retraction with sliding mechanics and a retraction spring: A three-dimensional analysis based on a midpalatal orthodontic implant. Eur J Orthod 2004;26:585-9. National Health Service (NHS) Center for Reviews and Dissemination. Report Number 4. Undertaking Systematic Reviews of Research on Effectiveness. 2 nd ed. University of York: York Publishing Services Ltd.; 2001. Liberati A, Altman DG, Tetzlaff J, Mulrow C, Gøtzsche PC, Ioannidis JP, et al. The PRISMA statement for reporting systematic reviews and meta-analyses of studies that evaluate health care interventions: Explanation and elaboration. J Clin Epidemiol 2009;62:e1-34.doi: 10.1016/j.jclinepi. 2009.06.006. Huffman DJ, Way DC. A clinical evaluation of tooth movement along arch wires of two different sizes. Am J Orthod 1986;83:453-9. Sonis AL, Van der Plas E, Gianelly A. A comparison of elastomeric auxiliaries versus elastic thread on premolar extraction site closure: An in vivo study. Am J Orthod 1986;89:73-8. Ziegler P, Ingervall B. A clinical study of maxillary canine retraction with a retraction spring and with sliding mechanics. Am J Orthod Dentofacial Orthop 1989;95:99-106. Samuels RH, Rudge SJ, Mair LH. A comparison of the rate of space closure using a nickel-titanium spring and an elastic module: A clinical study. Am J Orthod Dentofacial Orthop 1993;103:464-7. Lotzof LP, Fine HA, Cisneros GJ. Canine retraction: A comparison of two preadjusted bracket systems. Am J Orthod Dentofacial Orthop 1996;110:191-6. Daskalogiannakis J, McLachlan KR. Canine retraction with rare earth magnets: An investigation into the validity of the constant force hypothesis. Am J Orthod Dentofacial Orthop 1996;109:489-95. Samuels RH, Rudge SJ, Mair LH. A clinical study of space closure with nickel-titanium closed coil springs and an elastic module. Am J Orthod Dentofacial Orthop 1998;114:73-9. Dixon V, Read MJ, O'Brien KD, Worthington HV, Mandall NA. A randomized clinical trial to compare three methods of orthodontic space closure. J Orthod 2002;29:31-6. Nightingale C, Jones SP. A clinical investigation of force delivery systems for orthodontic space closure. J Orthod 2003;30:229-36. Bokas J, Woods M. A clinical comparison between nickel titanium springs and elastomeric chains. Aust Orthod J 2006;22:39-46. Deguchi T, Imai M, Sugawara Y, Ando R, Kushima K, Takano-Yamamoto T. Clinical evaluation of a low-friction attachment device during canine retraction. Angle Orthod 2007;77:968-72. Sukurica Y, Karaman A, Gürel HG, Dolanmaz D. Rapid canine distalization through segmental alveolar distraction osteogenesis. Angle Orthod 2007;77:226-36. Shpack N, Davidovitch M, Sarne O, Panayi N, Vardimon AD. Duration and anchorage management of canine retraction with bodily versus tipping mechanics. Angle Orthod 2008;78:95-100. Thiruvenkatachari B, Ammayappan P, Kandaswamy R. Comparison of rate of canine retraction with conventional molar anchorage and titanium implant anchorage. Am J Orthod Dentofacial Orthop 2008;134:30-5. Youssef M, Ashkar S, Hamade E, Gutknecht N, Lampert F, Mir M. The effect of low-level laser therapy during orthodontic movement: A preliminary study. Lasers Med Sci 2008;23:27-33. Martins RP, Buschang PH, Gandini LG Jr, Rossouw PE. Changes over time in canine retraction: An implant study. Am J Orthod Dentofacial Orthop 2009;136:87-93. Xu TM, Zhang X, Oh HS, Boyd RL, Korn EL, Baumrind S. Randomized clinical trial comparing control of maxillary anchorage with 2 retraction techniques. Am J Orthod Dentofacial Orthop 2010;138:544.e1-9. Kharkar VR, Kotrashetti SM. Transport dentoalveolar distraction osteogenesis-assisted rapid orthodontic canine retraction. Oral Surg Oral Med Oral Pathol Oral Radiol Endod 2010;109:687-93. Aboul-Ela SM, El-Beialy AR, El-Sayed KM, Selim EM, El-Mangoury NH, Mostafa YA. Miniscrew implant-supported maxillary canine retraction with and without corticotomy-facilitated orthodontics. Am J Orthod Dentofacial Orthop 2011;139:252-9. Raj AB, Kumar MV. Rapid canine retraction with dentoalveolar distraction osteogensis. J Indian Orthod Soc 2013;47:21-7. Mehta KR, Sable RB. Comparison of the amount of maxillary canine retraction with T-loops using TMA and stainless steel wires. A Clinical study. J Indian Orthod Soc 2013;47:178-83. Eslamian L, Borzabadi-Farahani A, Hassanzadeh-Azhiri A, Badiee MR, Fekrazad R. The effect of 810-nm low-level laser therapy on pain caused by orthodontic elastomeric separators. Lasers Med Sci 2014;29:559-64. McIlvaine E, Borzabadi-Farahani A, Lane CJ, Azen SP, Yen SL. Apriori feasibility testing of randomized clinical trial design in patients with cleft deformities and Class III malocclusion. Int J Pediatr Otorhinolaryngol 2014;78:725-30.